I had the pleasure of interviewing Katie Doub. 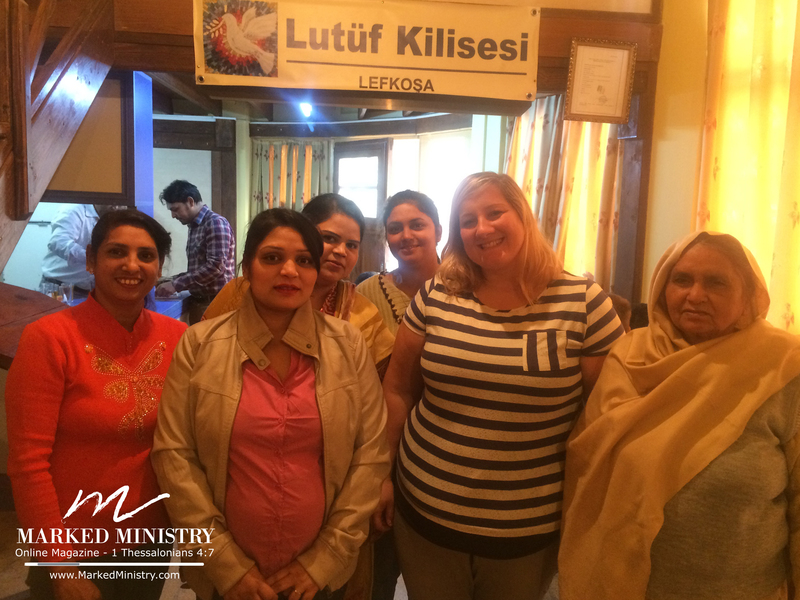 She is currently a missionary in Cyprus, a mom, and a pastor’s wife. This is her story told in her own words. I grew up in a small village in Northern England with my mum, step-dad and older brother. None of my family members were believers and my upbringing was loose and somewhat unstable. My family was in many of the local folk circles and from a young age I was carted around pubs and festivals. I loved it. But I always felt like I didn’t really meet up to anyone’s standards and expectations and I felt very insecure. During my early teenage years I enjoyed Friday nights at a local club frequented by skaters. My family had a lot going on personally and so I was on a free reign as far as where and with whom I was with. One night a guy approached me and started telling me about Jesus. I became uncomfortable quickly and made my excuses to get away. In the early morning hours when I was leaving the club I had come face to face with the same guy. “I really want to finish what I was telling you about Gods love,” he said. Something peaked my interest and for the next few hours we sat on the steps at the back of this club as he shared the Gospel with me. I was 15. I started attending a Church of England but never really understood about having a personal relationship with Christ and having my sins forgiven. Fast forward a year and I have moved out of my home and in with a couple of skater friends. A friend of theirs came over and started to lead a Bible study. He was living and working in London but would drive up on the weekends and teach us the Word. The church he attended in London was called Calvary Chapel and we were invited to go down and meet them. I’d never been so amazed by how sincere these people were and so interested in us, a group of messed up kids. We were asked to play music for an outreach in a small surf town in Woolacombe, England and we were so excited to do so. During the outreach no one really seemed very interested, so every night the pastor, Brain Brodersen, would sit on the cliffs with us and give us a Bible study. One evening it hit me, “I can have peace with God!” I prayed that night for the Lord to forgive my sins and received Christ as my Lord and Savior. I was playing music for an outreach apparently for myself. Later I attended a new Calvary Chapel church plant in York, which to this day is our home church and family. I also attended Bible College in Austria at 17 and when I was 19, I moved to help with a church plant in Pryluky, Ukraine. I was part of two church planting teams in Ukraine and lived there for six years seeing the Lord do remarkable things by saving and bringing hope to people from every background. After six years, two of my teammates were married and decided to move to Kyrgyzstan in central Asia to church plant. I was praying about where the Lord would have me next and so when they invited me, I accepted without a second thought. Paul and Melanie Billings had just had their first child when I arrived in Bishkek (Capital of Kyrgyzstan). I had just gone through a small battle with the Lord and felt Him ask to give up my expectations and hopes of being married and having my own family. I was 25 at the time and most of my friends were married. Here I was, moving to a Muslim country where the only other believers I knew there were not single either. I gave my desires to the Lord through many tears. The first day I arrived, I walked over to the Billings to find a young guy there name Jonathan who had come to serve with Paul and Mel. As Jonathan and I spent time serving the Lord together during the summer, we both felt that we knew the Lord was bringing us together. Yet, we were such different personalities and didn’t want anything the Lord didn’t want for our lives so we both left that summer. Within the next year, we were back in Bishkek and engaged. Proverbs 16:9 says, “A man’s heart plans his way, but the Lord directs his steps.” After being a young woman who desires to be in a relationship, I realize now that surrendering all our hopes and desires to the Lord is the safest and most fulfilling way to go about any relationship. I would never have sought Jonathan out and never would have logically put us together, but fast forward 10 years and the picture becomes clearer and clearer every day. Striving to manipulate and force things will only lead to pain and frustration. Going back to my story, we were in Bishkek 4 years, we moved back to York for 3 years and Jonathan taught at the Bible College and worked. I looked after our two young boys. During our time in York, Jonathan oversaw missions and outreach and received requests from pastors on the outreach team. One such request was from a pastor in the island of Cyprus. He sought the Lord for direction on how our family was to be involved. One morning I was reading in Isaiah 42 and verse 12 stuck out in my mind, saying, “Let them give glory to the Lord and declare his praise to the islands.” The verse kept pressing on my heart all day. I thought it was clear that the Lord was calling us to “an island” to declare his praise. A couple of weeks later we shared with each other what God was showing us and couldn’t believe how clearly the Lord was speaking to each of us individually. We later found out the Turkish people are some of the most un-reached people in the world. After a scouting trip, we moved to the north with our kids. We have been there almost five years now and although this past year has been spent receiving fellowship and encouragement in the US, we will return in June. I could share story after story about God’s faithfulness and love for the lost and story after story of the struggles, but one thing that is sure is that although the people are very hard to the Gospel, and ministering there can be an incredibly lonely time, Jesus has become more beautiful to me than ever before. It’s not until we have had nothing else to depend and rely on that we see where our affections really lie and upon whom we really trust. When all that we have is stripped back and you are in a place which has no church and you and your husband and kids are the only church, we then have the blessing of seeing Him fulfill our needs with His all sufficient grace and abounding love. 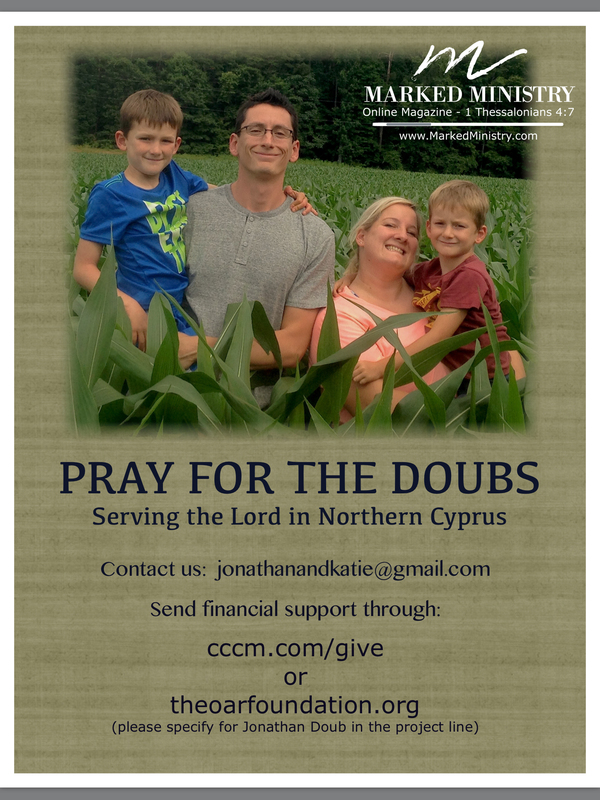 Partner with Katie and Jonathan for the Gospel through prayer or a financial gift at cccm.com or theoarfoundation.org.